For the Basketball Association of America team, see Washington Capitols. For the American Basketball Association team, see Washington Caps. The Washington Capitals are a professional ice hockey team based in Washington, D.C. They are members of the Metropolitan Division of the Eastern Conference of the National Hockey League (NHL). The Capitals are owned by Monumental Sports & Entertainment, headed by Ted Leonsis. From 1974 to 1997 the Capitals played their home games at the Capital Centre, in Landover, Maryland (a suburb of Washington, D.C.). 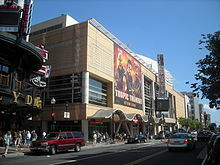 In 1997 the team moved to the arena now called Capital One Arena, their present home arena in Washington, D.C. The Capitals were founded in 1974 as an expansion franchise, alongside the Kansas City Scouts. Since purchasing the team in 1999, Leonsis revitalized the franchise by drafting star players such as Alexander Ovechkin, Nicklas Backstrom, Mike Green and Braden Holtby. The 2009–10 Capitals won the franchise's first Presidents' Trophy for being the team with the most points at the end of the regular season. They won it a second time in 2015–16, and did so for a third time the following season in 2016–17. In addition to eleven division titles and three Presidents' Trophies, the Capitals have reached the Stanley Cup Finals in 1998 and 2018, winning in the latter. The Capitals have retired the use of four numbers in honor of four players. In addition, the team holds an association with a number of individuals inducted into the Hockey Hall of Fame. The Capitals are presently affiliated with two minor league teams, the Hershey Bears of the American Hockey League, and the South Carolina Stingrays of the ECHL. Along with the Kansas City Scouts, the Capitals joined the NHL as an expansion team for the 1974–75 season (although the city of Washington was awarded a franchise on July 8, 1972). The team was owned by Abe Pollin (also owner of the National Basketball Association's Washington Bullets/Wizards). Pollin had built the Capital Centre in suburban Landover, Maryland to house both the Bullets (who formerly played in Baltimore) and the Capitals. His first act as owner was to hire Hall of Famer Milt Schmidt as general manager. With a combined 30 teams between the NHL and the World Hockey Association (WHA), the available talent was stretched thin. The Capitals had few players with professional experience and were at a disadvantage against the long-standing teams that were stocked with veteran players. Like the other three teams who joined the league during the WHA era—the Scouts (later the Colorado Rockies and now the New Jersey Devils), Atlanta Flames (now playing in Calgary), and New York Islanders—the Capitals did not factor the survival of the rival league into their plans. The Capitals' inaugural season was dreadful, even by expansion standards. They finished with far and away the worst record in the league at 8–67–5; their 21 points were half that of their expansion brethren, the Scouts. The eight wins are the fewest for an NHL team playing at least 70 games, and the .131 winning percentage is still the worst in NHL history. They also set records for most road losses (39 out of 40), most consecutive road losses (37), and most consecutive losses (17). Head coach Jim Anderson said, "I'd rather find out my wife was cheating on me than keep losing like this. At least I could tell my wife to cut it out." Schmidt himself had to take over the coaching reins late in the season. In 1975–76, Washington went 25 straight games without a win and allowed 394 goals en route to another horrendous record: 11–59–10 (32 points). In the middle of the season, Schmidt was replaced as general manager by Max McNab and as head coach by Tom McVie. For the rest of the 1970s and early 1980s, the Capitals alternated between dreadful seasons and finishing only a few points out of the Stanley Cup playoffs; in 1980 and 1981, for instance, they were in playoff contention until the last day of the season. The one bright spot during these years of futility was that many of McNab's draft picks (e.g., Rick Green, Ryan Walter, Mike Gartner, Bengt Gustafsson, Gaetan Duchesne, and Bobby Carpenter) would impact the team for years to come, either as important members of the roster or as crucial pieces in major trades. Pollin stuck it out through the Capitals' first decade, even though they were usually barely competitive. This stood in contrast to the Scouts; they were forced to move to Denver after only two years because their original owners did not have the resources or patience to withstand the struggles of an expansion team. By the summer of 1982, however, there was serious talk of the team moving out of the U.S. capital, and a "Save the Caps" campaign was underway. Then, two significant events took place to revive the franchise. First, the team hired David Poile as general manager. Second, as his first move, Poile pulled off one of the largest trades in franchise history on September 9, 1982, when he dealt longtime regulars Ryan Walter and Rick Green to the Montreal Canadiens in exchange for Rod Langway (named captain only a few weeks later), Brian Engblom, Doug Jarvis and Craig Laughlin. This move turned the franchise around, as Langway's solid defense helped the team to dramatically reduce its goals-against, and the explosive goal-scoring of Dennis Maruk, Mike Gartner and Bobby Carpenter fueled the offensive attack. Another significant move was the drafting of defenseman Scott Stevens during the 1982 NHL Entry Draft (the pick was made by interim general manager Roger Crozier, prior to Poile's hiring). The result was a 29-point jump, a third-place finish in the powerful Patrick Division, and the team's first playoff appearance in 1983. Although they were eliminated by the three-time-defending (and eventual) Stanley Cup champion New York Islanders (three games to one), the Caps' dramatic turnaround ended any talk of the club leaving Washington. The Capitals would make the playoffs for each of the next 14 years in a row, becoming known for starting slow before catching fire in January and February. However, regular-season success did not carry into the playoffs. 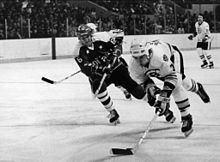 Despite a continuous march of stars like Gartner, Carpenter, Langway, Gustafsson, Stevens, Mike Ridley, Dave Christian, Dino Ciccarelli, Larry Murphy, and Kevin Hatcher, Washington was knocked out in either the first or second round seven years in a row. In 1985–86, for instance, the Caps finished with 107 points and won 50 games for the first time in franchise history, good enough for the third-best record in the NHL. They defeated the Islanders in the first round but were eliminated in the second round by the New York Rangers. The 1986–87 season brought even more heartbreak, with a loss to the Islanders in the Patrick Division Semi-final. This series was capped off by the classic Easter Epic game, which ended at 1:56 am on Easter Sunday 1987. The Capitals had thoroughly dominated most of the game, outshooting the Islanders 75–52, but lost in overtime when goaltender Bob Mason was beaten on a Pat LaFontaine shot from the blue line. For the 1989 playoff push, Gartner and Murphy were traded to the Minnesota North Stars in exchange for Ciccarelli and defenseman Bob Rouse. However, the goaltending once again faltered and they were eliminated in the first round by the Philadelphia Flyers. The Capitals finally made the Wales Conference Finals in 1990, but went down in a four-game sweep at the hands of the first-place Boston Bruins. From 1991 to 1996, the Capitals would lose in either the first or the second round of the playoffs. They would eliminate the Rangers in the first round but lost the second round to the Pittsburgh Penguins in 1991. In 1992 and 1993, they would lose in the first round to the Penguins and the Islanders, respectively. In 1994, they won their first round series against the Penguins but lost in the second round to the Rangers. In 1995 and 1996, they lost in the first round both times to the Penguins. They would miss the playoffs in 1997, but they came close to winning their first Stanley Cup one year later. Then in 1998, as the Caps opened MCI Center, Peter Bondra's 52 goals led the team, veterans Dale Hunter, Joe Juneau and Adam Oates returned to old form, and Olaf Kolzig had a solid .920 save percentage as the Caps got past the Boston Bruins, Ottawa Senators and Buffalo Sabres (the latter on a dramatic overtime win in game six on a goal by Joe Juneau) en route to the team's first Stanley Cup finals appearance. The Capitals won six overtime games, three in each of their series against the Bruins and Sabres. However, the team was outmatched by the defending champions, the Detroit Red Wings, who won in a four-game sweep. That same season, Oates, Phil Housley and Hunter all scored their 1,000th career point, the only time in NHL history that one team had three players reach that same milestone in a single season. After their 1998 championship run, the Capitals finished the 1998–99 season with a record of 31-45-6 and failed to qualify for the playoffs. During the season, the team was sold to a group headed by AOL executive Ted Leonsis. The Capitals went on to win back-to-back Southeast Division titles in 2000 and 2001, yet both years lost in the first round of the playoffs to the Penguins. After the 2000–01 season, Adam Oates demanded a trade but management refused and stripped him of his team captaincy. In the summer of 2001, the Capitals landed five-time Art Ross Trophy winner Jaromir Jagr, by trading three young prospects to the Pittsburgh Penguins. Jagr was signed to the largest contract ever in NHL history – $77 million over seven years at an average salary of $11 million per year (over $134,000 per game), with an option for an eighth year. However, after Adam Oates was traded to the Philadelphia Flyers, the Capitals failed to defend their division title and missed the playoffs in 2002 despite a winning record. Still, the 2001–02 season marked the highest attendance in franchise history, drawing in 710,990 fans and 17,341 per game. Before the 2002–03 season, the Caps made more roster changes, including the signing of highly regarded Robert Lang as a free agent, a linemate of Jagr's from Pittsburgh. Washington returned to the playoffs in 2003, but disappointed fans again by losing in six games to the Tampa Bay Lightning after starting off with a two-game lead in the best-of-seven first-round series. The series is well-remembered for the three-overtime Game 6 at the then–MCI Center. At the time it was the longest game in the building's history and was eventually decided by a power-play goal by Tampa Bay. In the 2003–04 season, the Caps unloaded much of their high-priced talent – not just a cost-cutting spree, but also an acknowledgment that their attempt to build a contender with high-priced veteran talent had failed. Jagr had never lived up to expectations during his time with the Capitals, failing to finish among the league's top scorers or make the post-season All-Star Team. The Caps tried to trade Jagr, but as only one year was left on the existing NHL Collective Bargaining Agreement (CBA) before it expired, few teams were willing to risk $11 million on an underperforming player. In 2004, Jagr was finally sent to the New York Rangers in exchange for Anson Carter and an agreement that Washington would pay approximately $4 million per year of Jagr's salary, with Jagr himself agreeing to defer (with interest) $1 million per year for the remainder of his contract to allow the trade to go ahead. This was quickly followed by Peter Bondra departing for the Ottawa Senators. Not long after, Robert Lang was sent to the Detroit Red Wings, as well as Sergei Gonchar to the Boston Bruins. The Lang trade marked the first time in the history of the NHL that the league's leading scorer was traded in the middle of the season. The Capitals ended the year 23–46–10–3, tied for the second-worst record, along with the Chicago Blackhawks. In the 2004 NHL Entry Draft, the Capitals won the Draft Lottery, moving ahead of the Pittsburgh Penguins, who held the NHL's worst record, and selected Alexander Ovechkin first overall. During the NHL labor dispute of 2004–05, which cost the NHL its entire season, Ovechkin stayed in Russia, playing for Dynamo Moscow. Several other Capitals played part or all of the lost season in Europe, including Olaf Kolzig, Brendan Witt, Jeff Halpern, and Alexander Semin. The Capitals' 2005 off-season consisted of making D.C.-area native Halpern the team's captain, signing Andrew Cassels, Ben Clymer, Mathieu Biron and Jamie Heward, and acquiring Chris Clark and Jeff Friesen via trade. The Capitals finished the 2005–06 season in the cellar of the Southeastern Division again, with a 29–41–12 campaign, earning 12 more points than the 2003–04 season, good for 27th out of the 30 NHL teams. The team, however, played close in every game, playing in 42 one-goal games, although losing two-thirds of those games. Ovechkin's rookie season exceeded the hype, as he led all 2005–06 NHL rookies in goals, points, power-play goals and shots. He finished third overall in the NHL in scoring and tied for third in goals, and his 425 shots not only led the league, but also set an NHL rookie record and was the fourth-highest total in NHL history. Ovechkin's rookie point total was the second-best in Capitals history, and his goal total was tied for third in franchise history. Ovechkin won the Calder Memorial Trophy, beating out Pittsburgh center Sidney Crosby and Calgary Flames defenseman Dion Phaneuf. Many longtime Capitals had career years, with Dainius Zubrus netting 57 points, Halpern having a career-best 33 assists, Matt Pettinger putting in a career-best 20-goal, 38-point effort and seven others on the relatively young team topping 20 points for the first time. Two notable landmarks were also hit by Capitals, as the team's longest tenured player, Olaf Kolzig, won his 250th game in goal, and Andrew Cassels became the 204th player to play 1,000 games, although he did not finish his season with Washington. A notable first was that Washington area native Jeff Halpern was named captain of his hometown Capitals. At the 2006 NHL trade deadline, on March 8, Brendan Witt was traded to the Nashville Predators. Alexander Semin had a breakout year during the 2006–07 season, scoring 38 goals during his second season in the NHL. In the 2006 off-season, Halpern left the Capitals to join the Dallas Stars; Chris Clark subsequently became the Capitals' new captain. Richard Zedník returned to the Capitals in 2006–07 after a disappointing 16-goal, 14-assist season in 2005–06 with the Montreal Canadiens, but was later dealt at the trade deadline to the New York Islanders after a disappointing and injury plagued season. The Caps also signed former Philadelphia Flyers enforcer Donald Brashear. Despite the transactions, however, the Capitals finished with the same point total (70) in 2006–2007 as they did the year before, although they won one fewer game. Alexander Ovechkin was the Capitals' lone representative in the season's All-Star Game, with Washington's campaign also seeing the breakout of Alexander Semin, who notched 38 goals in only his second NHL season. The Capitals signed Swedish phenom Nicklas Backstrom, the fourth overall pick in the 2006 NHL Entry Draft, to a three-year entry-level contract. They also signed 19-year-old Semyon Varlamov to a three-year entry-level contract. They then went on to fill needs at defense, signing puck-moving defenseman Tom Poti; right wing, by signing Viktor Kozlov; and center, by signing playmaker Michael Nylander. As a result of these signings, there was much more hope for the 2007–08 season and players were looking towards the playoffs. Alexander Ovechkin during Capitals practice, a day after signing a 13-year contract extension in January 2008. After starting the season 6–14–1, the Capitals fired head coach Glen Hanlon and replaced him with Hershey Bears head coach Bruce Boudreau on Thanksgiving Day, 2007. On January 10, 2008, the Capitals signed Ovechkin to an NHL-record $124 million contract extension at 13 years, the second-longest term of any contract in the NHL after New York Islanders goaltender Rick DiPietro's 15-year contract. Despite the Capitals' young defense and injuries to key players such as Michael Nylander and Brian Pothier, Boudreau engineered a remarkable turnaround. Aided by key acquisitions at the trade deadline (Matt Cooke, Sergei Fedorov and Cristobal Huet), Ovechkin's NHL-leading 65 goals, and Mike Green's league defensemen-leading 18 goals, the Capitals won the Southeast Division title for the first time since the 2000–01 season, edging out the Carolina Hurricanes for the Division title on the final game of the season. Washington's remarkable end-of-season run included winning 11 of the final 12 regular season games. The Capitals became the first team in NHL history to make the playoffs after being ranked 14th or lower in their conference standings at the season's midpoint. For the post-season, the Capitals drew the Philadelphia Flyers in the first round and managed to force a Game 7 after being down three games to one in the series. However, they ultimately lost to the Flyers 3–2 in overtime. After the season concluded, Boudreau's efforts were rewarded with a long-term contract extension. The accolades for the team continued to grow after the end of the season. Alexander Ovechkin won the Art Ross Trophy, the Maurice "Rocket" Richard Trophy, the Hart Memorial Trophy and the Lester B. Pearson Award, becoming the first player in NHL history to win all four awards in the same season. He also was the first player to win an MVP award in any major sport in the Washington, D.C., area since Joe Theismann won the National Football League (NFL) MVP award in 1983. Moreover, Ovechkin was also named an NHL First Team All-Star and became the first player since 1953 to be named as such in each of his first three years in the NHL. Nicklas Backstrom was a finalist for the Calder Trophy, but ended up second to the Chicago Blackhawks' Patrick Kane, though Backstrom was nonetheless selected to the All-Star Rookie Team. In addition to player awards, head coach Bruce Boudreau won the Jack Adams Award for the NHL's coach of the year. Ovechkin and Mike Green were named to the Sporting News All-Star Team, with Ovechkin being the Sporting News Player of the Year. The Capitals celebrate after defeating the New York Rangers in the 2009 Stanley Cup playoffs. The 2008–09 season was highlighted by the play of Mike Green (who was the third of the Capitals' three first-round selections in Ovechkin's draft year) and Ovechkin. Green led all NHL defensemen in goals and points, also setting the record for the longest consecutive goal scoring streak by a defenseman with eight games. Ovechkin won his second Hart Trophy, his second Lester B. Pearson Award and his second Maurice "Rocket" Richard Trophy. The Capitals finished the regular season with a record of 50–24–8 and a team-record 108 points, and they won their second consecutive Southeast Division championship. They then defeated the New York Rangers in the first round of the 2009 playoffs four games to three, overcoming a 3–1 deficit. The Capitals were then defeated by the eventual Stanley Cup champions, the Pittsburgh Penguins, in the Eastern Conference Semi-finals in seven games. The Capitals finished the 2009–10 season regular season first in the NHL with 121 points, thereby winning the Presidents' Trophy. Ovechkin led the team in points with 109 and finished as the third-highest goal scorer, despite playing nine games fewer than the league leaders. Backstrom finished with 101 points, fourth most in the NHL. Once again, Mike Green led all defensemen in points, finishing with 76. The Capitals also dominated the plus-minus category, finishing with five players in the top six in the league. Despite having a top-ranked regular season, Washington were defeated by the eighth-seeded Montreal Canadiens in the first round of the playoffs. The 2010–11 season saw the Capitals repeat as the Southeast Division champions and as the top team in the Eastern Conference with 107 points. The season was highlighted by their participation in the 2011 NHL Winter Classic, where they defeated the Pittsburgh Penguins 3–1 at Heinz Field. However, the Capitals' playoff disappointment continued. After again defeating the New York Rangers in five games in the first round, they were swept by the Tampa Bay Lightning in the Eastern Conference Semifinals. Joel Ward scored the overtime series-winning-goal in game seven against a heavily-favored Boston Bruins, in the 2012 playoffs. The Capitals started the 2011–12 season with a record of 7–0, but they only won five of their next 15 games. As a result, general manager George McPhee fired head coach Boudreau, hiring Capitals legend Dale Hunter as his replacement. By the end of the 2011–12 season, the team's top two goaltenders, Michal Neuvirth and Tomas Vokoun, were injured and the Capitals were required to lean on their goaltending prospect Braden Holtby to help the team into the 2012 playoffs. The Capitals made a strong push and finished with the seventh overall seed in East, draining the defending champion Boston Bruins in the first round. The Capitals shocked the NHL by defeating the heavily favored Bruins in seven games on an overtime goal by Joel Ward. Every game in the series was decided by a one-goal margin; previously, no single series in the Stanley Cup playoffs had ever gone as far as six or seven games while neither team ever held more than a one-goal lead. The Capitals then advanced to the second round to face the top-seeded New York Rangers. The series again went seven games, ending with a 2–1 Rangers victory at Madison Square Garden. Following the season's end, head coach Dale Hunter announced he would step down. Adam Oates was later named permanent head coach of the team. The lockout-shortened 2012–13 season saw the Capitals off to a rocky start, as they managed just two wins in their first ten games. The team rebounded to win the Southeast Division, thereby earning the third seed in the Eastern Conference playoffs. Unfortunately for Washington, the Capitals' playoff woes continued as they again fell to the Rangers in seven games. In the 2013–14 season, the Capitals started the season winning five of their first ten games. The Capitals struggled to stay in a playoff spot and ultimately missed the playoffs for the first time since 2006–07. On April 26, 2014, 15 days after the regular season ended, the Capitals announced they would not renew general manager George McPhee's contract and that they had fired head coach Adam Oates. The Capitals hosted the Chicago Blackhawks for the 2015 NHL Winter Classic at Nationals Park. On May 26, 2014, the Capitals announced the promotion of Brian MacLellan from director of player personnel to general manager and the hiring of Barry Trotz as the new head coach. In Alexander Ovechkin's 691st NHL game on November 4, 2014, he became the Capitals' all-time points leader during a game against the Calgary Flames, surpassing Peter Bondra. On January 1, 2015, the Washington Capitals defeated the Chicago Blackhawks 3–2 in the annual NHL Winter Classic at Nationals Park in Washington, D.C. The Capitals finished in a second-place tie with the New York Islanders in the Metropolitan Division during the 2014–15 season and held home ice advantage in the first-round playoff series between the two, as they had defeated the Islanders in the season series with two home wins and two road overtime losses (in comparison, the Islanders had two home wins, one road loss and one road shootout loss). The teams split the first four games of the series, with the Islanders winning the first and third games, and the Capitals winning the second and fourth games. After winning Game 5, the Capitals had a chance to clinch the series in Nassau Veterans Memorial Coliseum, but the Islanders won Game 6 to send the series to a deciding Game 7 in Washington, which the Capitals would go on to win and defeat the Islanders, setting up a match-up against the top-seeded Rangers in the Second Round for the third time in four years. In the second round, all seven games were decided by a one-goal margin. The Capitals and the Rangers split the first two games (with Joel Ward scoring a game-winning buzzer beater goal for Washington in Game 1, coupled with a loss by Washington in Game 2) by a 2–1 margin. Braden Holtby would then post a 1–0 shutout in Game 3, with Jay Beagle scoring the game's only goal, which was then followed by another 2–1 victory in Game 4. After Washington held a 3–1 series lead, the Rangers would then cut the series lead to 3–2 after scoring the game-tying goal and the game-winning overtime goal in Game 5. The Rangers then tied the series with a 4–3 victory in Game 6 to force a Game 7 at Madison Square Garden. Both teams scored a goal during regulation time in Game 7, but the Capitals would lose the game and the series in overtime via a Derek Stepan goal. Ovechkin during the 2016–17 season. In January 2017, he became the 84th NHL player to reach the 1,000-point milestone in the NHL. In the 2015–16 season, the Capitals finished in first place in the league with a record of 56–18–8 and 120 points. In the first round of the playoffs, they would face the Philadelphia Flyers. The Capitals won the first three games of the series and were looking for their first sweep in the playoffs of a best-of-seven series in franchise history. However, the Flyers would win the next two games to send the series to a sixth game in Philadelphia; the Capitals nevertheless won that series in six games to advance to the second round of the playoffs. In the second round, they faced the Pittsburgh Penguins for the first time since 2009. After winning the first game of the series in Washington, the Capitals lost three straight games, and were in danger of elimination. Washington would stave off elimination with a win in Game 5, but they would lose the series in six games, with the Penguins going on to win the Stanley Cup. Ovechkin reached the 1,000-point milestone on January 11, 2017 with a goal against the Pittsburgh Penguins 35 seconds into the first period of that game. Ovechkin is the 84th NHL player to reach the 1,000-point milestone, the fourth Russian-born player and the 37th player to reach the milestone while playing for one team throughout their NHL career. The Capitals won their second Presidents' Trophy in a row, becoming just the seventh team in NHL history to win back-to-back Presidents' Trophies. Ovechkin finished the 2016–17 regular season with 33 goals, leading the Capitals in goals for the twelfth straight season. In the 2017 playoffs, the Capitals defeated the Toronto Maple Leafs in six games in the first round to set up a second consecutive showdown with the Pittsburgh Penguins in the second round. After falling behind 3–1 in the series, they battled back to force a game seven at home, where they were eliminated 2–0, and lost their series 4–3. After the 2017 playoffs, the Capitals were unable to retain a number of players, losing Kevin Shattenkirk, Karl Alzner, Justin Williams, and Daniel Winnik to free agency, and budding young defenseman Nate Schmidt to the 2017 NHL Expansion Draft. In addition, to get under the cap, the Capitals shipped Marcus Johansson to the New Jersey Devils. Despite a slow 5-6-1 start, which extended out to 10-9-1, the Capitals caught fire in December, going 10-2-2, and were able to clinch the Metropolitan Division for a third straight year on April 1. They qualified for the 2018 Stanley Cup playoffs for the 10th time in 11 years. In the playoffs, the Capitals were able to battle back from a 2–0 series deficit against the Columbus Blue Jackets in the first round of the 2018 playoffs, winning four straight and beating the Blue Jackets in six games. They faced the Penguins again in the second round, and this time, on May 7, 2018, they were able to beat the Penguins in the second round with an overtime goal on the road in Game 6 by Evgeny Kuznetsov. It marked the first time in 20 seasons that the Capitals made a Conference Final and the first time in 24 seasons that they had defeated the Penguins in a playoff series. The Stanley Cup at the Capitals victory parade in Washington, D.C. following their victory in the 2018 Stanley Cup Finals. The Capitals advanced to the 2018 Stanley Cup Finals on May 23, after beating the Tampa Bay Lightning in seven games after a 4–0 rout at Amalie Arena in Tampa. The Capitals then faced the expansion Vegas Golden Knights and overcame them in five games, including a 4–3 win in the decisive game five at T-Mobile Arena after Lars Eller scored with about seven minutes to go. Not only was it the Capitals' first Stanley Cup win, but it was also the first championship for a Washington, D.C. team in one of the four major North American sports leagues (the NFL, the NHL, the NBA and MLB) since the Redskins defeated the Buffalo Bills 26 years beforehand in Super Bowl XXVI. 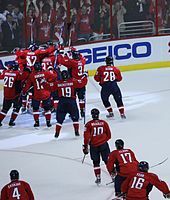 On April 4, 2019, the Capitals clinched their fourth straight Metropolitan Division title and with that accomplishment, Washington became only the second organization in NHL history to with four consecutive division titles twice in their history (Boston Bruins from 1927–28 to 1930–31 and again from 1975–76 to 1978–79). The Capitals' previous streak was from the 2007–08 season to the 2010–11 season in the now defunct Southeast Division. NBC Sports Washington (NBCSW) has carried Capitals games locally since its founding as Home Team Sports (HTS) in 1984. NBC Sports Washington was known as Comcast SportsNet Mid-Atlantic (CSN) from 2001 through 2017. NBCSW's commentators are Joe Beninati, Craig Laughlin, and Al Koken. The Capitals' flagship radio station is WJFK-FM (106.7 FM); commentators are John Walton and Ken Sabourin. The team's radio network consists of stations in Washington, Virginia, Maryland, West Virginia, Pennsylvania, and North Carolina. WTOP-TV (channel 9) picked up television coverage for the Capitals' first three seasons, covering 15 road games in the 1974–1975 season. Legendary sportscaster Warner Wolf was the commentator for the first season. Team radio broadcaster Ron Weber moved to the TV booth for telecasts in the second and third seasons. The Capitals moved to longtime home WDCA (channel 20) in the 1977–1978 season. WDCA later split games with HTS/CSN upon its founding in 1984. The 1991–92 season illustrates a typical arrangement: WDCA showed 20 road games and any road playoff games, while HTS picked up 34 home games and any home playoff games, leaving 28 regular-season games not televised. After 19 seasons on WDCA, the Capitals moved their over-the-air broadcasts to WBDC (channel 50) for the 1995–1996 season. All 82 games were televised for the first time in the 2001–2002 season. The Capitals have not aired any games over-the-air locally since the end of the 2005-2006 season. WTOP (1500 AM) was the Capitals' first radio home through the 1986–1987 season. After nine years on WMAL (630 AM), the games returned to 1500 AM for the 1996-97 season. Ron Weber was the first announcer, and never missed a game through his retirement at the end of the 1996–1997 season. WJFK-FM began airing postseason games during the 2008 playoffs. 1500 AM, since renamed WFED, remained the flagship station until 2012, when WJFK took over all coverage. WFED continues to broadcast games as a network affiliate. This is primarily to take advantage of its 50,000-watt clear-channel signal, which brings Capitals games to the entire eastern half of North America at night. Weber rejoined current announcers Walton and Sabourin for the first period of Game 4 of the 2018 Stanley Cup Final. WJFK-FM attracted controversy when it elected to drop the Capitals in the 2016–2017 season, leaving the Capitals to air solely on WFED. However, WFED's signal is unusable in some portions of the Washington suburbs at night, since it is directed north-south to protect co-channel KSTP. The Washington Wizards also took priority over the Capitals on WFED in case of a conflict, leading to some games in which the only home broadcast was available via Internet streaming. The team responded to fan complaints by reaching a temporary deal in January 2017 to place the rest of its games on WWDC-HD2, which is available metro-wide to those with HD Radios and has a low-powered analog signal that covers the city itself. The Capitals reached a deal to return to WJFK-FM for the 2017–2018 season. Original logo used by the Capitals (1974–1995). The Capitals took to the ice in red, white and blue jerseys featuring contrast-colored shoulders and stars on the chest and sleeves. The team originally had red, white, and blue pants options, but retired the white pants only after a few games in their first season, and the red ones at season's end. The blue pants would eventually become the only option used. Prior to the start of the 1995–96 season, in an attempt to modernize the look and improve merchandise sales, the team abandoned its traditional red, white and blue color scheme in favor of a blue, black, and bronze palette with an American bald eagle with five stars as its logo. The alternate logo depicted the Capitol building with crossed hockey sticks behind. For the 1997–98 season, the team unveiled a black alternate jersey, devoid of blue with bronze stripes on the ends of sleeves and at the waist. Prior to the 2000–01 season, the team retired its blue road jersey in favor of this, but still kept the white jersey for home games. Second and third black, blue, and bronze logos used by the Capitals. The logo on the left was used from 1995 to 2002, while the logo on the right was used from 2002 to 2007. The Capitals unveiled new uniforms on June 22, 2007, which coincided with the NHL Entry Draft and the new league-wide adaptation of the Reebok-designed uniform system for 2007–08. The change marked a return to the red, white and blue color scheme originally used from 1974 to 1995. The new primary logo is reminiscent of the original Capitals' logo, complete with a hockey stick formed by the letter "t"; it also includes a new feature not present in the original logo in the form of three stars representing DC, Maryland and Virginia. More simply, the stars are a reference to the flag of Washington, D.C., which is in turn based on the shield of George Washington's family coat of arms. The new alternate logo uses an eagle in the shape of a "W" with the silhouette of the United States Capitol building in the negative space below. For the 2011 NHL Winter Classic, the Capitals wore a white jersey honoring the franchise's past with the original logo. The jersey resembled the one the franchise wore from 1974 to 1995. Instead of wearing the combination of blue pants and white helmets the team used when it played at the Capital Centre, the Capitals chose red pants and helmets for the New Year's Day game. The Capitals wore the same jersey, minus the NHL Winter Classic patch, on February 1, 2011, to honor Hockey Hall of Fame winger Dino Ciccarelli. The current alternate logo used by the Capitals, introduced in 2007. The Capitals announced on September 16, 2011, that they would wear a third jersey modeled after the Winter Classic jersey for 16 road games during the 2011–12 season. For the 2015 Winter Classic, which took place on New Year's Day at Nationals Park in Washington, D.C., the Capitals wore a newly designed jersey intended to pay homage to hockey's outdoor roots. The primary color of the jersey was a vintage deep red. The addition of stripes on the shoulders, waist and legs brought in elements of Washington's professional hockey jerseys from the 1930s, predating the Capitals franchise's formation in the 1970s. A large "W" on the front of the jersey, topped with the common three stars, offset in blue to contrast the white "Capitals" word-mark. Starting with the 2015–16 season, the Capitals will wear their throwback red third jerseys, replacing the white Winter Classic thirds. Prior to the 2017–18 season, the NHL announced a new partnership with Adidas, and the Capitals unveiled new uniforms with minor changes. There were no third jerseys during that season, but the return of the program in the 2018–19 season saw the return of the Capitals' red throwback uniforms as their alternates. For the 2018 Stadium Series, the Capitals used newly-designed navy uniforms, honoring the fact that the game was held at the U.S. Naval Academy. The chest logo was based on the regular stylized “Capitals” logo, but shortened to “Caps”, the nickname commonly used for the team. There were also features honoring various aspects of D.C., as well as the presence of a slightly altered W logo from the 2015 Winter Classic on the pants. 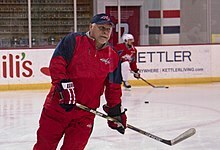 Barry Trotz at the Capitals practice at Kettler Capitals Iceplex. Trotz guided the Capitals to their first Stanley Cup championship. The Washington Capitals hold an affiliation with a number of inductees to the Hockey Hall of Fame. Eight inductees from the players category of the Hall of Fame are affiliated with the Capitals. In 2015, two former Capital players, Sergei Fedorov, and Phil Housley, were the latest Capitals players to be inducted into the Hall of Fame, with five out of the eight (Gartner, Oates, Stevens, Langway, and Murphy) having played at least five seasons with the club. In addition to players, members of the local sports media that cover the Capitals, and the NHL, were honored by the Hockey Hall of Fame. In 2007, Dave Fay, a sports journalist for the Washington Times was a recipient of the Elmer Ferguson Memorial Award. In 2010, play-by-play radio broadcaster, Ron Weber, was awarded the Foster Hewitt Memorial Award from the Hall of Fame for his contributions to hockey broadcasting. The Capitals honor the retired numbers of Rod Langway, Yvon Labre, Mike Gartner and Dale Hunter with banners in the Capital One Arena. Nicklas Backstrom is the franchise's all-time assist leader for the regular season. As of the end of the 2017–18 season, he has recorded 590 assists in 815 games. ^ a b Ovechkin was selected a First Team All-Star at right wing, and a Second Team All-Star at left wing for the 2012–13 season. ^ "Detailing The Uniform". WashingtonCaps.com. NHL Enterprises, L.P. June 22, 2007. Retrieved May 8, 2018. ^ "Capitals Jersey Timeline". WashingtonCaps.com. NHL Enterprises, L.P. Retrieved March 3, 2019. ^ "Hunter's hat trick lifts Caps". The New York Times, January 10, 1998. Retrieved July 14, 2011. ^ "Sports". USA Today. Retrieved September 5, 2012. ^ "Ovechkin passes single-season mark as Capitals keep playoff hopes alive". ESPN. Retrieved April 3, 2008. ^ El-Bashir, Tarik (April 6, 2008). "Coming All the Way Back". The Washington Post. Retrieved May 27, 2010. ^ "2009-2010 - Regular Season - All Skaters - Summary - Points - Stats". National Hockey League. Retrieved August 8, 2012. ^ Carrera, Katie (May 26, 2014). "Capitals name Brian MacLellan general manager, Barry Trotz coach". Washington Post. Archived from the original on July 22, 2015. ^ "Washington Capitals' Alex Ovechkin sets franchise record for points". National Hockey League. October 29, 2015. Retrieved November 10, 2015. ^ "Capitals lose to Rangers 2-1 in OT in Game 7". The Washington Times. Retrieved November 10, 2015. ^ "Alex Ovechkin scores 1,000th NHL point". National Hockey League. January 12, 2017. Retrieved February 2, 2017. ^ "Alex Ovechkin scores twice, passes 1,000 points in win over Penguins". ESPN. January 12, 2017. Retrieved February 2, 2017. ^ Clinton, Jared (April 7, 2017). "Does winning back-to-back Presidents' Trophies set the Capitals up for success?". The Hockey News. Retrieved April 12, 2017. ^ "Washington Capitals Franchise Index". Hockey-Reference.com. Retrieved April 12, 2017. ^ "Alex Ovechkin, Capitals put halt to 20-year East finals drought". ESPN. Retrieved May 8, 2018. ^ "Caps Blank Bolts in Game 7 to Earn Trip to Stanley Cup Final". ^ a b "HTS, Channel 20 to air 54 Caps games". The Baltimore Sun. August 21, 1991. ^ "Caps Radio 24/7". Washington Capitals. ^ a b "10 Questions for the Dean of D.C. Hockey, Ron Weber". On Frozen Blog. November 9, 2006. ^ Carmody, John (September 12, 1995). "The TV Column". The Washington Post. ^ "Caps popularity draws more TV coverage". The Washington Times. ^ "Sabres 4, Capitals 0". Japers' Rink. ^ "Fanfare". The Washington Post. June 12, 1986. ^ Fisher, Marc (May 6, 1997). "Radio Waives News". The Washington Post. ^ Williams, Jim (April 5, 2011). "Caps radio has the region rockin' the red". Washington Examiner. ^ "Capitals 2012-13 Regular-Season Schedule". National Hockey League. ^ Allen, Scott (June 4, 2018). "Ron Weber will join Caps radio booth for Game 4: 'We needed to have him be a part of it'". The Washington Post. ^ Steinberg, Dan (January 23, 2017). "Capitals broadcasts return to FM radio". The Washington Post. ^ Steinberg, Dan (October 4, 2017). "Capitals radio broadcasts will return to 106.7 The Fan this season". The Washington Post. ^ "Back in Red, White and Blue, Caps Make a Colorful Statement" The Washington Post June 22, 2007. ^ "Capitals Unveil Uniform for 2011 Bridgestone NHL Winter Classic". Washington Capitals. October 2, 2010. Retrieved October 10, 2010. ^ "Postgame Notebook: Canadiens 3, Capitals 2, SO". Washington Capitals. February 1, 2011. Archived from the original on February 6, 2013. Retrieved September 5, 2012. ^ "Capitals to Wear Third Jersey for 16 Road Dates in 2011-12 - Washington Capitals". Washington Capitals. September 16, 2011. Retrieved September 5, 2012. ^ "Washington Capitals Roster". NHL.com. Retrieved October 7, 2018. ^ "Washington Capitals Hockey Transactions". TSN.ca. Retrieved October 15, 2018. ^ "Capitals Announce Changes to Front Office and Coaching Staff". Washington Capitals. April 26, 2014. Retrieved November 10, 2015. ^ "Stanley Cup Champions and Finalists". National Hockey League. 2018. Retrieved June 7, 2018. ^ Johnston, Mike (June 29, 2015). "Lidstrom, Pronger, Fedorov, Housley nominated to HHOF". Sportsnet.ca. Rogers Digital Media. Retrieved May 9, 2018. ^ "Elmer Ferguson Memorial Award Winners". Hockey Hall of Fame and Museum. 2018. Retrieved May 9, 2018. ^ "Foster Hewitt Memorial Award Winners". Hockey Hall of Fame and Museum. 2018. Retrieved May 8, 2018.